Chocolate-Chip Pretzel Bread Pudding. © Barbara Rolek licensed to About.com, Inc.
Pretzel bread/rolls are all the rage right now, but what do you do with leftovers? The same things you'd do with any leftover bread product. I like to make bread pudding. This recipe was inspired by one from Labriola Baking Company, one of the largest producers of pretzel bread in the U.S. Purchased pretzel bread or rolls (you will need 1 pound) will work fine in this recipe, but try making your own rolls, it's really easy and the recipe is below. Here is a larger photo of Chocolate-Chip Pretzel Bread Pudding. Add 1 1/2 cups warm water, 1 tablespoon instant dry yeast and 2 teaspoons sugar to the bowl of a stand mixer fitted with the dough hook attachment. Stir and let rest until foamy, 5 to 10 minutes. Add 4 1/2 cups all-purpose flour, 2 teaspoons sea salt and 4 tablespoons melted butter, and mix until well combined, about 5 minutes. The dough will be very stiff. Cover with plastic wrap and let rise in a warm place until doubled. Line a large baking sheet with parchment paper and set aside. Portion out dough into 12 equal pieces (or two baguettes, if desired). Knead each piece for a few seconds and then, cupping the dough piece, move in a circular fashion, nails scraping the work surface, until a smooth ball is formed. Place, seam side down, on lined baking tray. Repeat with remaining dough. Cover with greased plastic wrap and let rise in a warm place until doubled. Place rack in middle of oven and heat to 425 degrees. Lightly coat a wire cooling rack with cooking spray, place it on top of a baking sheet and set aside. Bring 2 quarts water to a boil and remove from heat while adding the baking soda because it will foam up. Stir and return to the heat and bring to a low boil. Place 3 to 4 pretzel balls in the water at a time, seam side down, and simmer for 1 minute. Flip over and simmer another 1 minute. Remove with a slotted spoon or skimmer to the prepared cooling rack. Repeat with remaining balls of dough. Lightly brush each roll with the beaten egg, making sure to coat the sides. Sprinkle with coarse salt and make an X-shaped slash in the tops of each roll, if desired. Bake 15 to 20 minutes. Cut 1 pound cooled pretzel bread or rolls into 1-inch pieces and let sit out overnight or lightly toast in oven. Alternatively, you can also use store-bought pretzel bread rolls, about 1 pound. In a saucepan, heat 2 cups heavy cream and 1/2 cup sugar until sugar is dissolved. Remove from heat and let cool to room temperature. In a large bowl, beat 3 large room-temperature eggs. Whisk room-temperature cream-sugar mixture into the beaten eggs until thoroughly incorporated. Add beans from 1/4 scraped vanilla bean or 2 teaspoons good-quality vanilla and a pinch of salt, and whisk again. Add chocolate chips, making sure the egg-custard mixture is at room temperature (so as not to melt the chips) and stir. Toss the bread into the custard mixture, mixing thoroughly. If using custard cups or ramekins that are not silicone, coat them lightly with cooking spray. Divide the bread-custard mixture evenly among the 8 cups. Place in a larger pan (that will serve as a water bath) and refrigerate overnight. 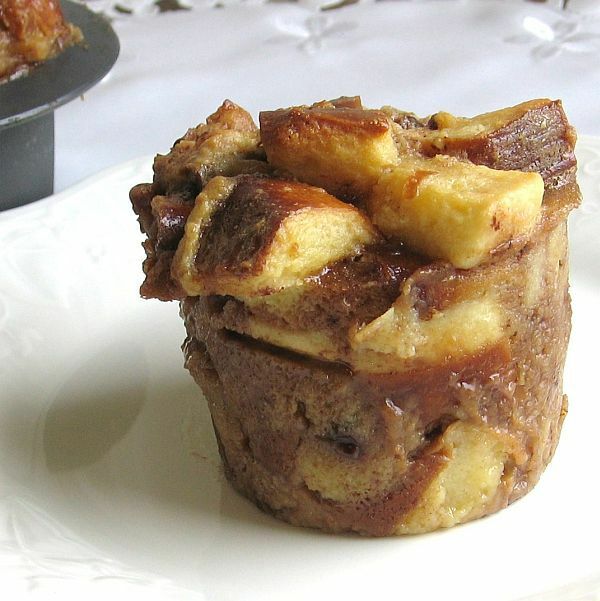 When ready to bake, remove the bread pudding from the refrigerator and let come to room temperature. Heat the oven to 325 degrees. Fill the larger pan the ramekins are sitting in with hot water to come 3/4 of the way up the sides of the ramekins and place in the oven. Bake about 45 minutes or until knife tests clean when inserted in the center of the bread puddings. Don't unmold until ready to serve.